"Improving Food & Beverage Margins with Improving supply chain visibility"
Food and beverage organizations must have integrated systems that provide supply chain visibility into remote processes and events to catch problems before they reach the market. Although current supply chain management (SCM) tools provide food and beverage executives more supply chain visibility to help them quickly adapt their companies to changing conditions, today’s globally competitive market demands an even fresher, more innovative approach. 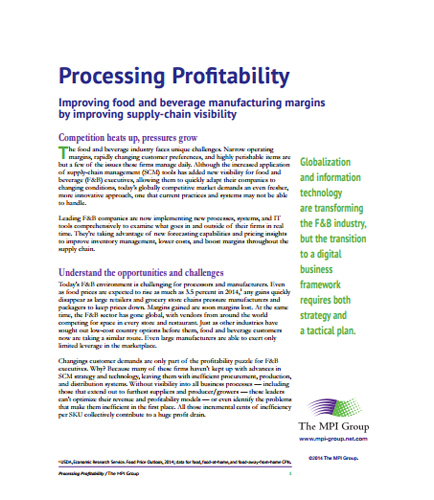 In this white paper on “Processing Profitability”, learn how modern supply chain management systems, business analytics and IT tools can improve visibility in supply chain and help transform today's food and beverage industry business challenges into opportunities. E.U. regulation No 1169/2011 on the provision of food information to consumers is a new European Union directive that affects both manufacturers and retailers. It applies to food business operators at all stages of the food chain, where their activities concern the provision. Compliance with INCO will ensure that product information is consistent throughout the supply chain at every consumer touch-point, both in-store and online. What this whitepaper on '' E.U. Regulation No. 1169/2011'' covers? This whitepaper not only defines requirement standards of the new E.U. regulation no. 1169/2011 (INCO), but also explains how to better deal with the regulation. What are the changes in new EU Regulation No 1169/2011 on food labeling? What are the major impacts on the food and beverage companies due to New EU regulation No 1169/2011? What are the best practices to avoid slowing down innovation processes due to INCO regulation? Is INCO regulation only a costly and time-consuming constraint? Download this informative whitepaper to learn more about the rules in accordance with Regulation No 1169/2011 and food information regulations. What is Food Safety ? Food safety is a methodical regulation relating to the management, preparation, and storage space of food in ways with the purpose of preventing food borne diseases. This includes an amount of routines that ought to be followed to keep away from probable health hazards. What is Food Management ? Food management is an extensive course of action that involves the appropriate supervision of food assortment, preparation, arrangement, and conservation. The food service manufacturer relies deeply on a number of different managers to take charge of each and every portion of the procedure to guarantee the superiority, flavor, and safety of whichever food served or sold to the common community, is healthy and in conformity with the neighboring standards.